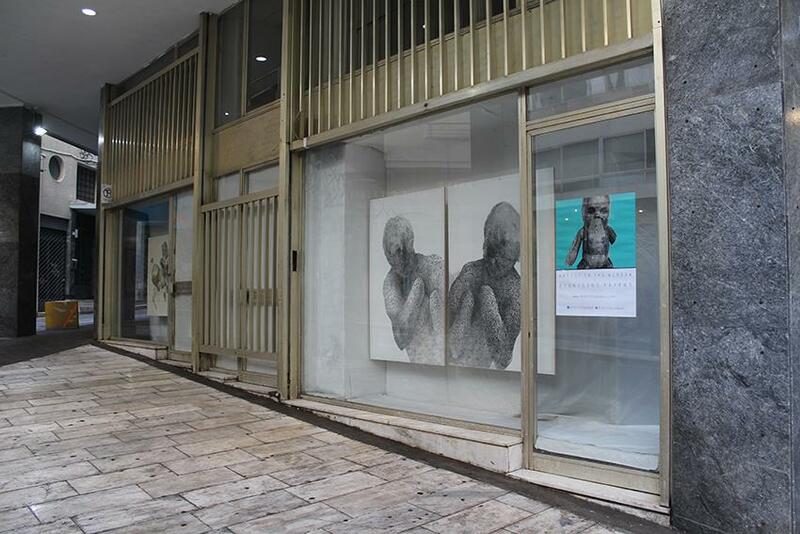 On the corner of Aiolou and Kolokotroni St in downtown Athens, a series of empty shop windows that are part of a University of Athens building have been transformed into a temporary gallery showcasing the work of local artists. 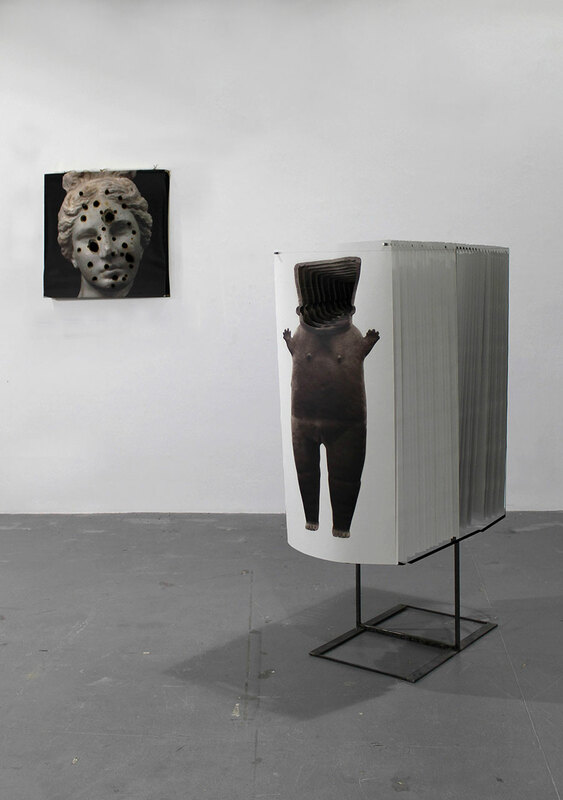 Organised by Konstantinos Besios, the showcase is currently hosting works by visual artist Dionisios Pappas inspired by his background in archaeology. 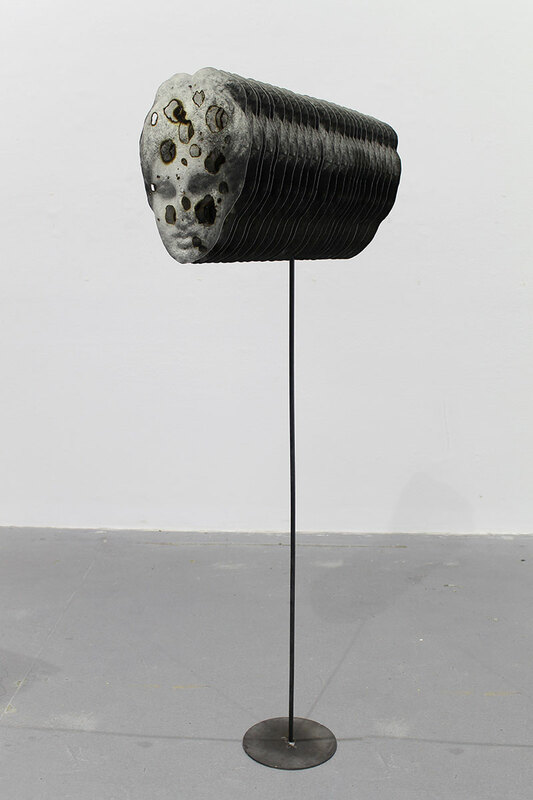 Fascinated by how the past is being interpreted in the presence and questioning the hegemony of classical Greek art over every other kind of Greek art (including that of his own time), Pappas is using images of ancient Greek sculptures to create multi-layered works that play with perspective, depth and our perception of beauty. 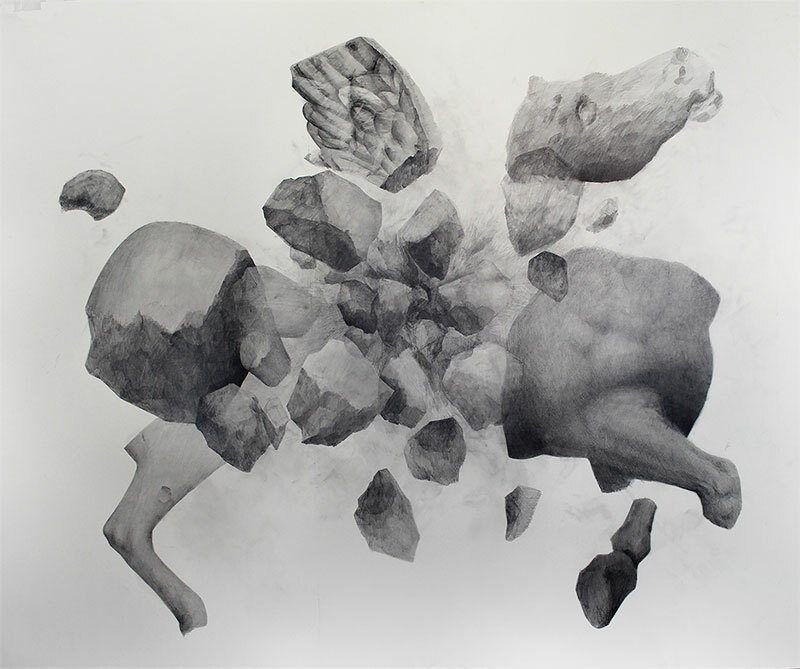 All photos courtesy the artist. As Pappas explained over a chat we had in front of the works on Aiolou St, there is a certain authority and aesthetic ideal associated with artworks coming from the golden age of ancient Athens. This ideal of beauty, harmony and balance has been adopted of course by the Romans, and later on influenced the neoclassical aesthetics of the West. 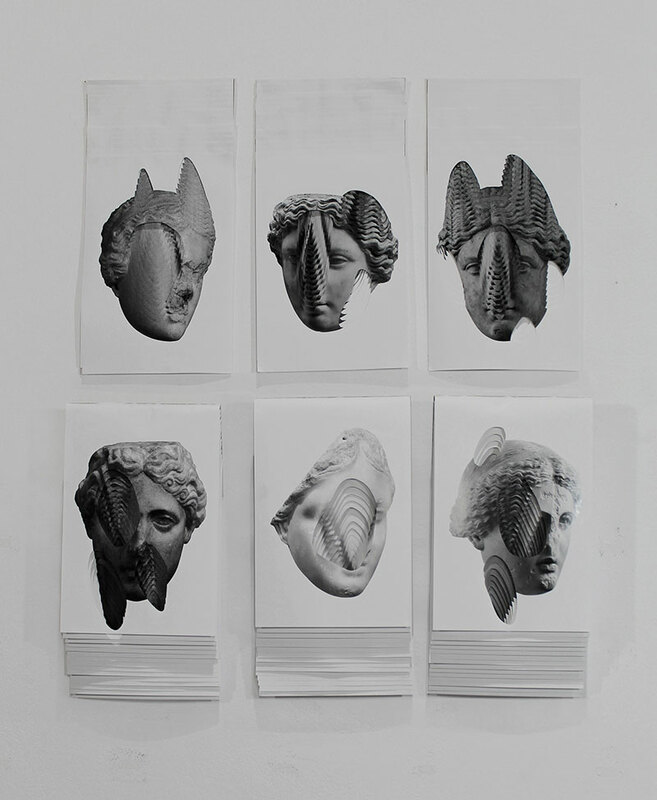 By perforating, burning, fragmenting and folding stereotypical images of idealised ancient Greek beauty, Pappas is pointing to the inevitable decay and wear of time as a way to remind the viewer that these works are neither eternal nor timeless. The fact that he uses paper is also reinforcing this impermanence, and undermines the timelessness associated with marble as a material. 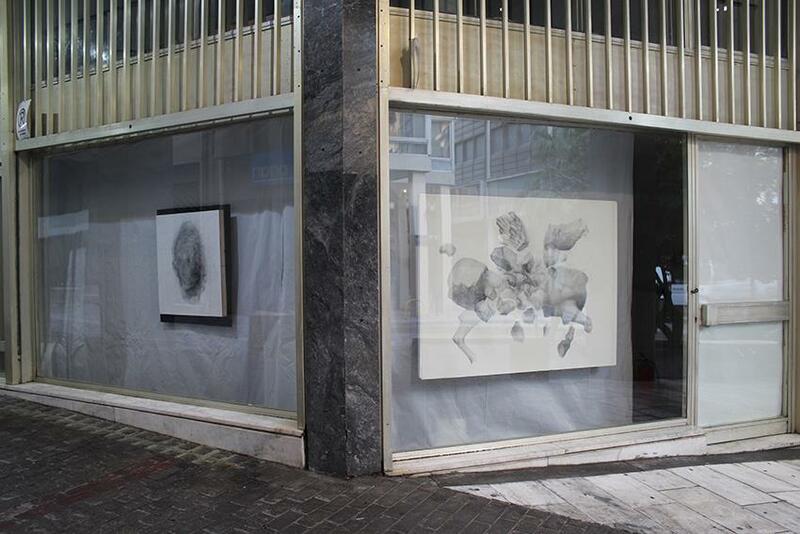 In other works shown at this pop-up gallery, Pappas deals with identity and the layered experience of one’s own self. 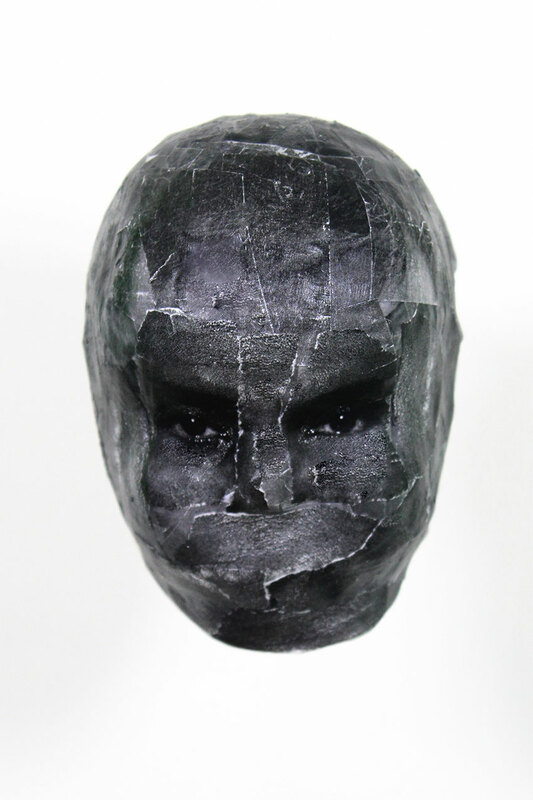 In a series of sculptures he has covered baby dolls with prints of his own face, as a way to play with self-awareness and encountering one’s identity from the outside. 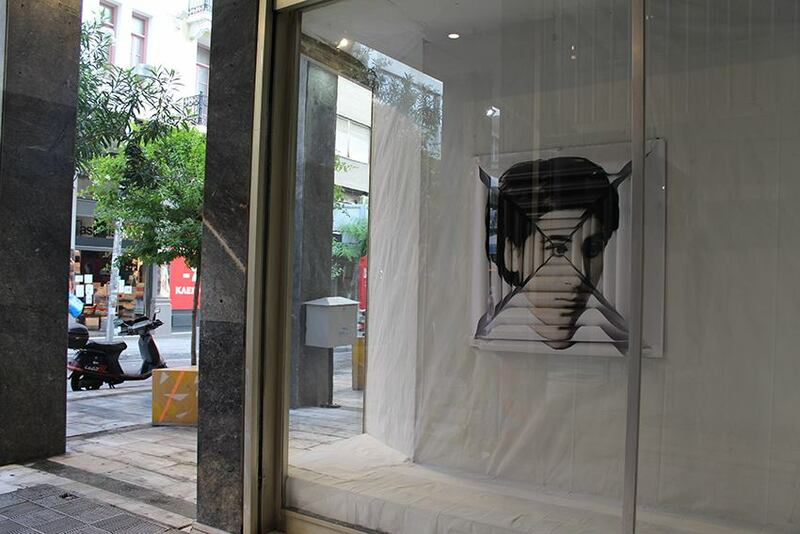 In another window, a photo portrait of the artist’s mother has been composed from several layers of the same image folded in a geometrical pattern, in an attempt to create a sense of depth and perspective with a flat image. 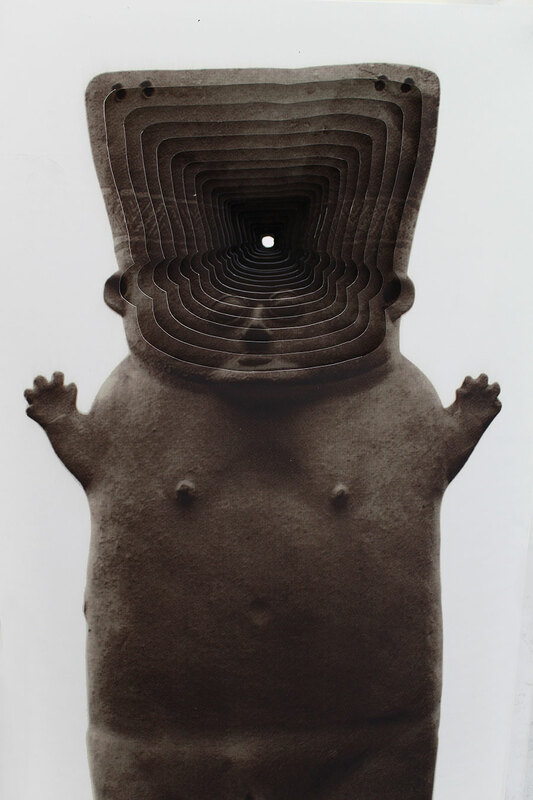 Right next to it, a series of colour prints hanging from a metal structure show two Peruvian idols printed on either side of a stack of paper sheets, their faces carved to create a tunnel that leads from one to the other like a vortex — all as a comment on human connectedness and the paradox of falling in love. On the two side walls of the building Pappas has installed two large murals with the permission of the University. 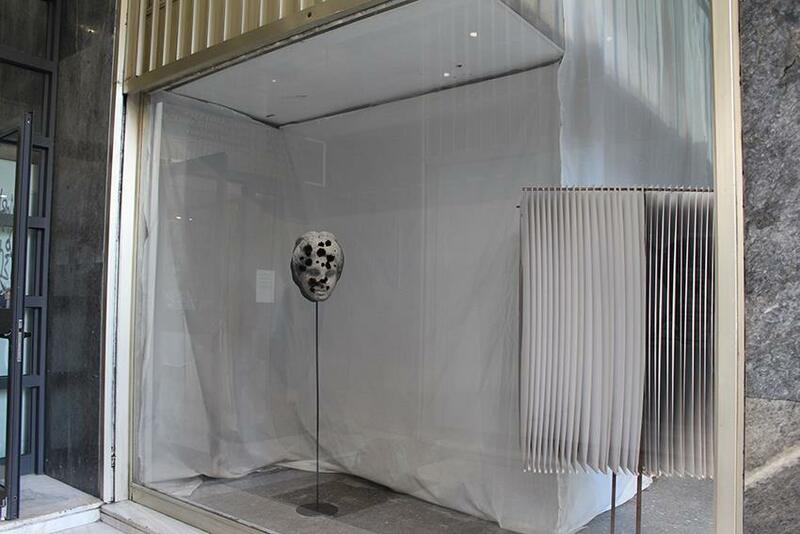 They show a cascade of coins that have zero value, referencing the studies in political sciences and public administration that take place within the building, as well as the overall financial climate in the country. 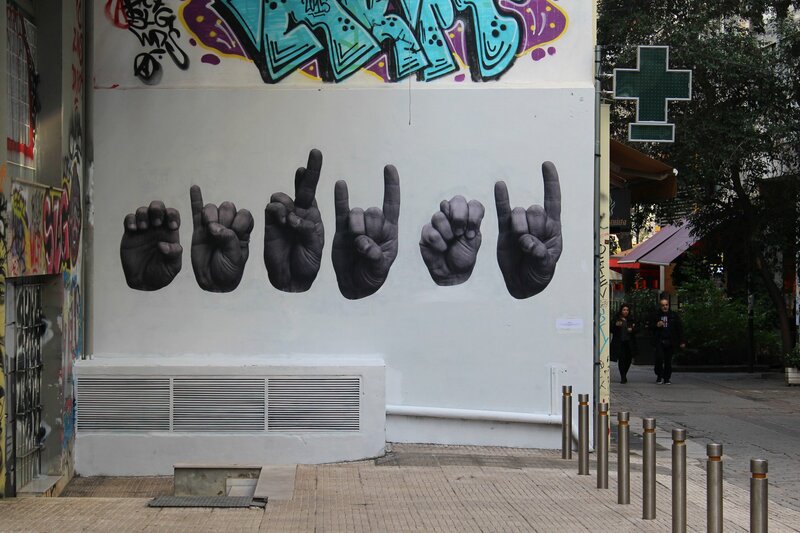 The two murals are the culmination of the artist’s preoccupation with street art in Athens: he has created several recognisable pastes around the city, including many quirky collages with his own face and an eye-catching assortment of hand gestures on Themistokleous St near Omonia. 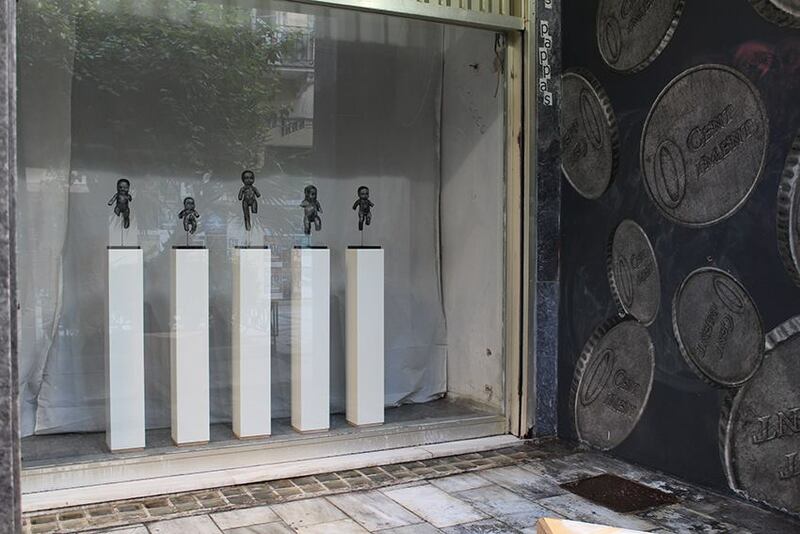 Dionisios Pappas’s exhibition at the Aiolou corner shop is also part of his engagement with public space, since all the works are visible from the street day and night, and will remain on display until October 2018.